Below is a post originally written by Ali Meshkati of Zenolytics. Ali has provided us with permission to republish the post he recently wrote for his readers. As much as sentiment can be a confounding concept, the below commentary seems to sum up the state of the current market. As the persistence of the current bounce becomes apparent, the trembling, crooked fingers of the average asset manager have become increasingly disfigured rendering them unable to pick up their saltine crackers and grape juice as they ponder ways in which to allocate their cash in a comfortable manner. And that right there is the problem or perhaps, the solution, to the current perception of this recent rally. The comfort level in buying this run up on some of the lightest volume we have seen in years is simply not there. It doesn’t exist. Leaving asset allocators no choice but to stew in their own rigidity as they await what may never come. According to the BofA Merrill Lynch fund manager survey released some weeks ago, fund manager cash levels are at two year highs. Nothing Earth shattering in an overly-bearish tone, but still relevant in judging the perception of the current market. When institutions increase cash levels it is because they either 1) believe that equities will become cheaper at some point down the road, allowing them to buy back in over several months OR 2) are unsure in their belief of the equity markets, rendering them unable to make any decisions of consequence as to how assets should be allocated. Cash then becomes the safest bet until the market convinces them otherwise. In both cases, institutional fund managers will have their hands forced by a market that presses to the upside. This is because institutions do not have the luxury of sitting out rallies in their benchmark based on simple theory. Not after what has transpired in terms of under-performance for the past 5 years paired with an increasing array of options for investors to gain exposure to equities without the need for an asset manager that has under-performed greatly. In the current circumstance, you can see a market that is intentionally running away from those who are attempting to coax it back into a position that would provide the comfort needed to gain exposure. Each headline that passes with news of an all-time record high in the S&P 500 is similar to a jab to the gut of the fund manager who is neither comfortable, competent nor desirous of exposure to a creature he frankly does not understand. As averages that have been abhorred as under-performers and dead money in 2014, such as small-caps and growth continue their surge, more pressure will build on those who are under-invested to catch up. Eventually leading to the catch up trade that typically marks short to intermediate term highs in the market. During the entirety of this exercise in articulate buffoonery, everything from volume to valuations to generic, yellow boxed macro concerns will be cited as evidence of the need for conservatism in the face of record highs in the popular indices. To no avail, however. In the end, the need to have a job trumps theory in any shape or form. And the quickest way to lose a job on Wall Street is to trail behind it. A trait that has become oddly commonplace among far too many. In essence, fear not, the markets are doing their duty in cajoling future french fry artists and ice cream masons onto the path that destiny has chosen. 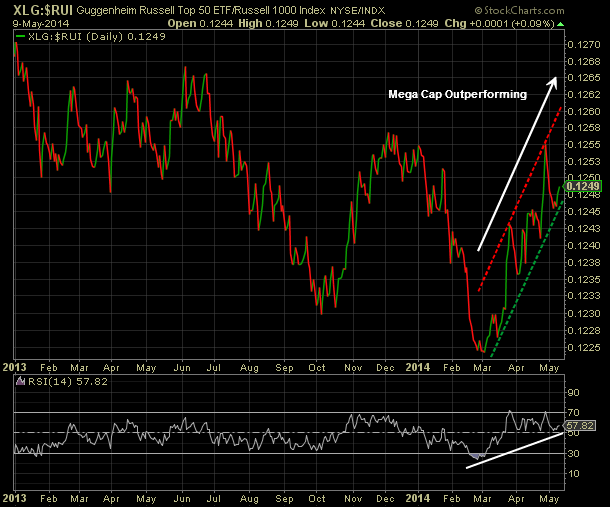 The difficulty in buying this market is as bullish an element in any as assessing its upside potential. Be confident in that fact. Being somewhat of a contrarian I use the above headline with trepidation as I look back at the number of articles published in February and March of this year that equated the 2012 - 2014 market with that of the crash of 1928 - 1929. 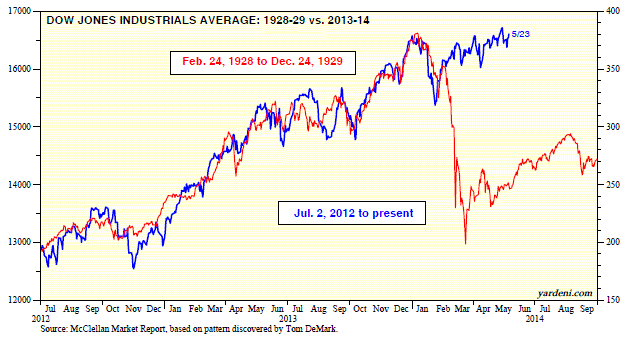 We wrote an article in mid February, 1929 Crash: Charts That Mislead Investors, that pointed out the difference between 1928 - 1929 to 2012 - 2014. Fast forward to today and the so-called "scary chart" looks like a crash has been averted. The below chart is courtesy of Yardeni Research and the chart would indicate the market is not following the 1928 - 1929 pattern. Several potential market moving economic data points will be released this week. Durable goods orders will be released Tuesday morning, jobless claims Thursday as well as the second revision of first quarter GDP. The GDP announcement will be watched closely as Thursday's report will be the first revision of the advanced reading reported in April when Q1 GDP was reported at .1%. The consensus estimate is for GDP to be revised down to a negative .5%. One important measure used by the National Bureau of Economic Research (NBER) that goes into determining whether the economy is in a recession is two consecutive quarters of negative GDP growth. If the Q1 revision is negative, then some will say the economy is one half the way towards a recession. The GDP report will certainly provide fodder for the financial media. Importantly, other factors are incorporated into the recession call. The Department of Commerce's Bureau of Economic Analysis notes employment, personal income, and industrial production are important factors also. Several of the article links in this week's magazine discuss the positives associated with the current equity market. Conversely, several of the links focus on the negative aspects of the current market environment with the sell off in small caps and the investor rotation out of the momentum names. My posting has been limited the past couple of weeks as I was fulfilling my civic duty of serving as a juror on a trial in my county. Below is the link to this week's magazine. I suppose last week was an eventful one as the S&P 500 Index reached a new intra-day high on Tuesday of 1902.17. The "century" levels, 1900 in this case, tend to be strong psychological resistance levels for the market and a close above 1900 was not realized. Most U.S indices ended down on the week from flat to -.6%. The Nasdaq generated a small .5% gain. The economic data continues to be indicative of an economy experiencing slow economic growth. April retail sales were week with the "weather" excuse no longer valid. And consumer sentiment and industrial production both experienced unanticipated declines. In the coming week, potentially market moving releases will be, FOMC minutes released on 5/21, jobless claims and existing home sales on 5/22 and new home sales on 5/23. Next Monday is Memorial Day in the U.S.and markets will be closed. With the holiday being a three day weekendd, many traders will head out of town early as the end of this week nears. A number of the articles in this week's Week Ahead Magazine focus on the anticipated correction and negativity around corporate earnings. Being a bit of a contrarian, it seems many are calling for the proverbial 10% correction and I would not be surprised if one does not unfold this summer outside of some unanticipated external shock. At the beginning of this year many were calling for higher interest rates for a whole host of reasons. I think Ryan Detrick's recent commentary and his bullish bond call late last year sums up the contrarian sentiment calls pretty well. Below is a link to this week's magazine. "...the EP ratio is a key input in a standard growth accounting framework. In this framework, real GDP is the product of (1) real GDP per worker, (2) the percentage of the population that is employed, and (3) the civilian population. The first term approximates labor productivity and the second term is the EP ratio. Mathematically, we can transform each of the three components into growth rates and then add them together to produce real GDP growth. Since population growth tends to change very little in the short-to-medium term, the growth accounting framework is useful because it shows why real GDP growth accelerates or slows. Thus, has real GDP growth changed because of changes to the growth of labor productivity, EP ratio, or some combination of the two? One reason why average real GDP growth during this expansion (2.24 percent) has been so slow is that labor productivity growth has been relatively slow: 1.48 percent per quarter (annualized) through the first quarter of 2014. As shown in the graph, the other reason is that the EP ratio is still below the level that prevailed at the trough of the past recession (second quarter of 2009). Since then, the EP ratio has declined by an average of 0.26 percent per quarter (annualized). Until the growth of the EP ratio strengthens, the pace of the economy’s growth will remain quite modest (emphasis added). That is, assuming population growth remains constant, if labor productivity growth doesn’t accelerate, neither will economic growth." As a result, one key question from this economic data point is to ask the question, what is constraining job growth? No one factor is likely contributing to this phenomenon; however, several regulatory factors are likely contributors. The Affordable Care Act and the Act's redefinition of a full time worker as one working 30 hours per week and a proposal to increase the minimum wage to $10.10 per hour by 2016. Businesses have already responded to the increased cost of labor by replacing employees with technology. Several large restaurant chains have introduced tablet computers at tables allowing patrons to order and pay for meals without the need of a server. Certainly there needs to be a cost/benefit balance in labor regulatory requirements. At the current slow rate of employment growth though, regulations increase labor costs will continue to constrain employment growth and result in a low level of economic growth in the foreseeable future. 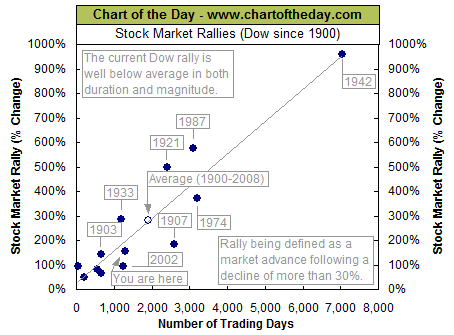 Earlier this week the Chart of the Day charting service provided information on Dow rallies over the past 114 years. As the below chart shows, the current advance in the Dow lags the average Dow rallies in terms of magnitude and duration. The commentary included with the Chart of the Day graph is as follows. "The Dow just made another all-time record high. To provide some further perspective to the current Dow rally, all major market rallies of the last 114 years are plotted on today's chart. Each dot represents a major stock market rally as measured by the Dow with the majority of rallies referred to by a label which states the year in which the rally began. For today's chart, a rally is being defined as an advance that follows a 30% decline (i.e. a major bear market). As today's chart illustrates, the Dow has begun a major rally 13 times over the past 114 years which equates to an average of one rally every 8.8 years. It is also interesting to note that the duration and magnitude of each rally correlated fairly well with the linear regression line (gray upward sloping line). As it stands right now, the current Dow rally that began in March 2009 (blue dot labeled you are here) would be classified as well below average in both duration and magnitude. However, the magnitude and duration of the current post-financial crisis rally has now reached median status -- its magnitude and duration is greater than six and less than six Dow rallies since 1900." One favorable aspect to the highest-quality companies/stocks is they tend to fall less in down equity markets. If an investor then structures their portfolio to loss less when the market does correct, the return needed in a subsequent market rebound is smaller if the loss is smaller. Over a complete market cycle then, if one losses less and stays in the game on the upside, they will tend to outperform the overall market. 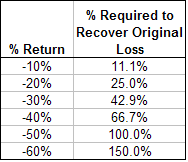 Incurring significant losses in down markets is what does the most damage to compounding one's portfolio growth. "The highest-quality stocks tended to outperform the overall market and the lowest-quality stocks." "These stocks particularly tended to outperform during months in which the market fell by at least 3%." "The lowest-quality stocks tended to outperform the market and the highest-quality stocks during months in which the market rose by at least 3%." 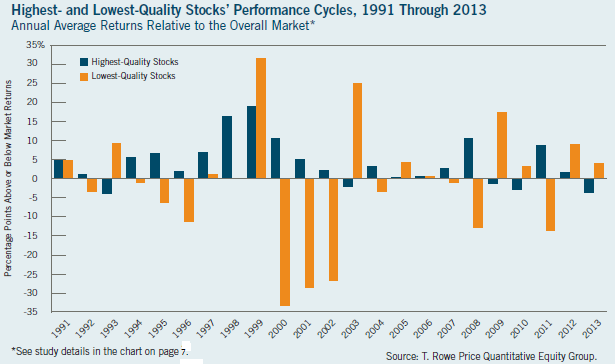 "Periods of outperformance of high-quality stocks tended to persist for up to 24 months." "The same general trends were found among stocks in developed and emerging regions around the world." The outperformance in down markets actually equates to positive returns for the highest quality companies as can be seen in the below chart. In every year the lowest quality stocks generated a negative return, the highest-quality stocks generated a positive return. One important takeaway from the T. Rowe Price study is the fact the lowest quality stocks tended to outperform after coming out of a recession. I think it is fair to say the current economy is not now just coming out of a recession. So instead of simply selling in May, focusing on the highest quality companies is an alternative. Keep in mind though, a number of the highest quality companies have experienced strong returns this year, pushing some of their stock valuations to the higher end of their historical ranges. Lastly, Atlanta Capital Investment Managers publishes an in depth quarterly Quality Scorecard Report that can be accessed under "Quality Scorecards" on their publications tab for readers interested in more detail on quality rankings. Except for the .4% gain in the Dow Jones Industrial Average last week, equities ended the week on a mostly negative note. The market continues to have a heightened focus on the so-called internal rotation taking place among specific equity sectors and stocks. The weaker areas of the market have been in small cap stocks, down 4.8% this year and the specific momentum segments: biotech, social media and technology stocks. Some market moving economic data will be released this week, retail sales, CPI and PPI, industrial production, jobless claims and housing starts, just to name a few. A number of additional economic reports will be released and interested readers can view Econoday's weekly calendar for additional detail. Below is the link to this week's magazine. At the end of February the year to date performance for the dividend payers in the S&P 500 Index significantly trailed the performance of the non-payers by a large 673 basis points. Two months later, the end of April, the year to date average return of the payers now exceeds the non-payers by 66 basis points. Much has been written about the bubble bursting in some of the momentum names, like Amazon (AMZN) down 26.7% YTD, Verisign (VRSN) down 19.8% YTD and Yahoo (YHOO) down 16.5% YTD, all non-dividend paying stocks. Conversely, the telecommunication and utility stocks have significantly outperformed the overall market. The utility ETF (XLU) is up 11.3%, CenturyLink (CTL) is up 14.8% and Winstream Holdings (WIN) is up 15.2% this year, all dividend payers. The other factor influencing investor returns in March and April is the the outperformance of mega cap stocks like Exxon Mobil (XOM), Apple (AAPL), Microsoft (MSFT), Johnson & Johnson (JNJ) and Chevron (CVX). These stocks are all dividend payers and top holdings in the Guggenheim Russell Top 50 Index (XLG). The sideways trending market this year, along with investor cautiousness as the "sell in May" seasonality phenomenon gets much attention, both have contributed to investors seeking safety in these higher quality mega cap dividend payers. This past week's Sentiment Survey report by the Association of Individual Investors shows individual investor bullish sentiment declined further to 28.34% from the prior week's level of 29.77%. The weekly sentiment readings tend to be volatile and looking at the 8-period moving average shows the average sentiment reading is 31.5%, still a low level. 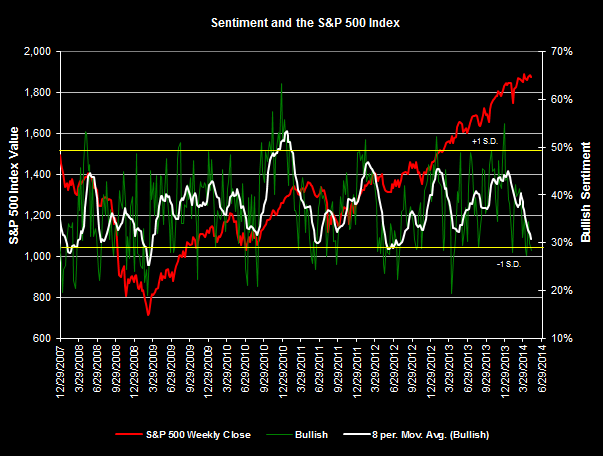 Many of the survey participants indicated a neutral view on the market as the neutral reading was reported at 42.99%. The last time the neutral reading was above 42% was September of 1999 when the neutral reading was reported at 42%. To remind readers, the AAII sentiment survey readings are viewed as contrarian indicators. The significance of the quality ranking is it takes into account the consistency of earnings and dividend growth over the prior ten years. Historically, companies that have a higher consistency in growing their earnings and growing their dividends tend to be less volatile in declining markets. 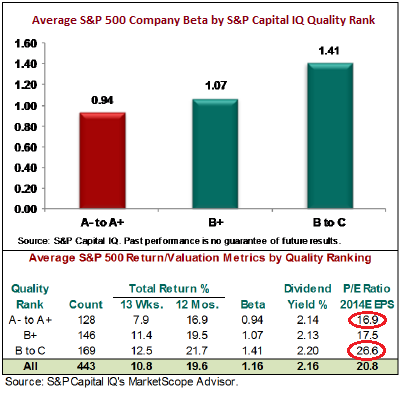 The below table details the average beta of the A- to A= quality ranked stocks versus their counterparts with a rating of B+ and lower. The report contains a list of twenty companies that S&P screened on quality and Fair Value Ranking that readers may find of interest. The equity market continues to be stuck in a trading range that has generated nearly flat returns on a year to date basis. Although most U.S. market indices were higher last week, YTD returns are muted: S&P 500 Index (1.8%), Dow Jones Industrial Average (-.4%), Russell 2000 (-3.0%). This past week the apparently strong employment report indicated the unemployment rate declined 40 basis points to 6.3%. A significant negative in this report is the decline in the rate was primarily a result of the continued decline in the participation rate to 62.8%. 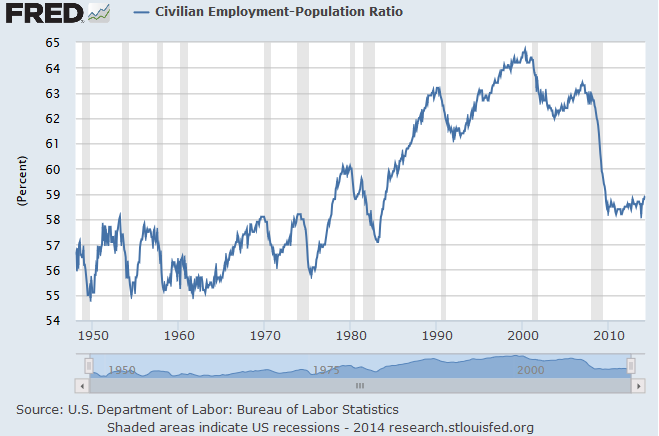 The unemployment report noted the labor force fell a massive 806,000. A number of articles in this week's magazine discuss implications surrounding last week's job's report. "Sell in May" continues to be a topic du jour and hopefully this week's magazine will be the end of the "sell in May links. Lastly, several links provide commentary on the continued rotation occurring within the market. Since mid April growth is once again outperforming value providing further evidence the market is struggling to breakout of the 2014 trading range. Are Mutual Funds Preparing For A Correction? 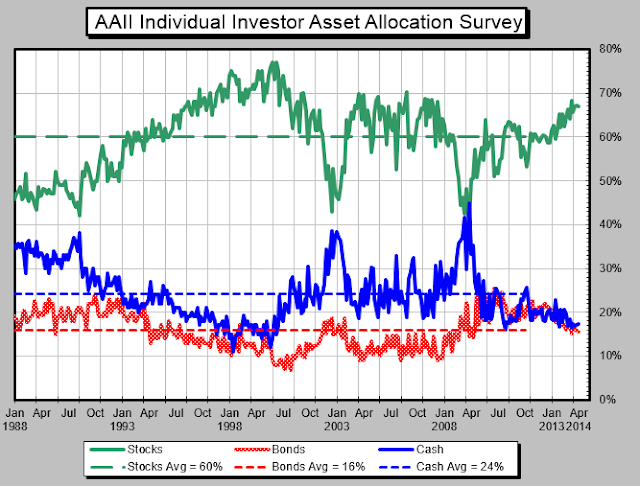 From an asset allocation perspective individual investors' equity weighting has reached a level last seen in mid 2007. According to the American Association of Individual Investors monthly asset allocation survey, the equity weighting at the end of April equaled 67%. This is down slightly from the 67.2% in the prior month; however, the prior high in the equity weighting level was 68.6% reach in June of 2007. Certainly the strong equity market advance since the end of the Great Recession has contributed to this higher equity weighting. 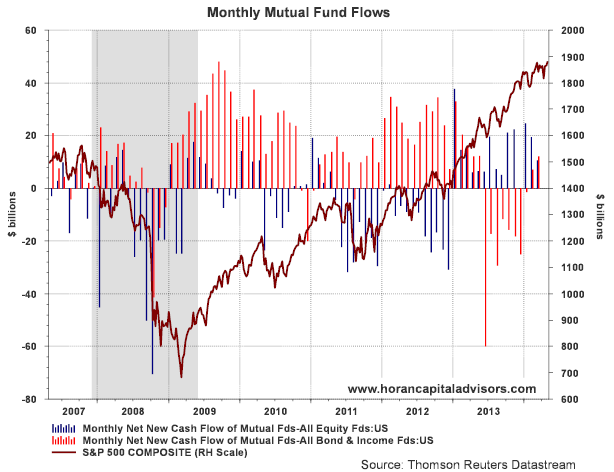 Also, in spite of the fact investor fund flow data shows investors were cautious on allocating funds to equity until the beginning of 2013, equity flows continue to be positive. A bit surprising is the fact investor fixed income flows were positive in February and March as can be seen in the below chart. So given the strong equity advance since 2009 and the individual investor's desire to increase equity exposure, generally late in a market cycle, are mutual fund companies preparing for an equity correction? 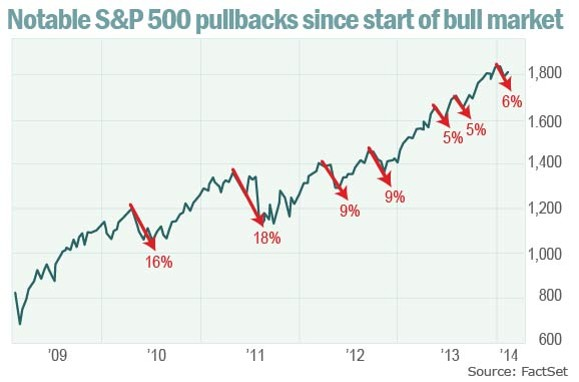 The market has not experienced a 10% plus correction since late 2011. 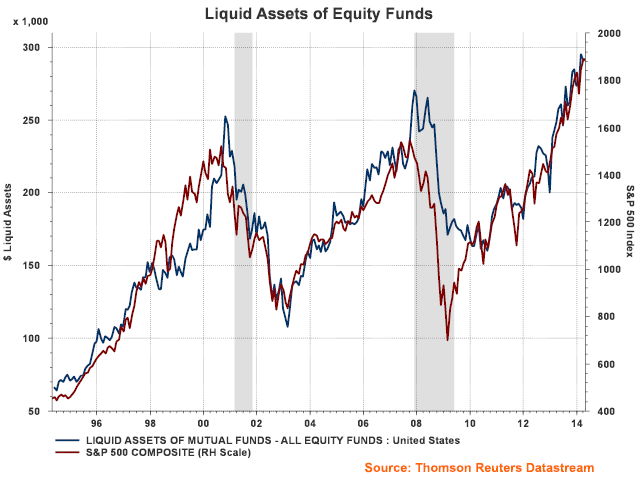 The below chart compares liquid assets of mutual funds to the trend in the S&P 500 Index. The chart would seem to indicate fund managers are having more difficulty finding attractive investments and, maybe at the same time, preparing for investors to reduce equity exposure at the first sign of a market pullback. In reviewing several sentiment indicators like the AAII Sentiment Survey and the Commitment of Traders Report, excessive bullishness by individuals or small investors does not seem present at the moment. These sentiment indicators can change fairly quickly though.